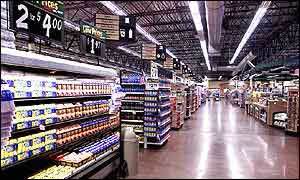 Wal-Mart is a global discount retailer headquartered in Bentonville, a small city in Arkansas, USA. Wal-Mart is a public corporation, the largest public corporation by revenu, one of the biggest retailers in the world, and its stock is traded in several international stock exchanges. Sam’s Club and Marketside stores are operating divisions of Wal-Mart corporation, In some international markets Wal-Mart stores trade under local names, ASDA in the UK, Bompreço in Brazil, Mi Bodega or Superama in Mexico, or Seiyu in Japan. The history of Wal-Mart reads like a curriculum vitae for the corporate founder Sam Walton, who started his discount store named Walton’s Five and Dime in 1950. Previously Walton had operated a Ben Franklin store in Newport, Arkansas that he franchised from 1944 until 1950, but then relocated to Bentonville, Arkansas in 1950 and continuing his association with Ben Franklin but renaming the store as Walton’s Five and Dime. By the late 1950s Walton owned a small network of Walton’s Five and Dime stores and had come to the realization that successful discount retailing didn’t just involve getting the best price from suppliers, but also meant passing those savings onto customers. Walton’s method contrasted starkly with his competition yet the higher volumes sold in Walton’s stores were evidence that he had found a model that would spur his company onto greater profits. By 1962 Sam Walton owned 11 stores, and taking a huge gamble, he and his wife Helen reinvested everything they could spare into a new store at Rogers, Arkansas which became the very first Wal-Mart branded store. The concept was an immediate success leading to spectacular growth of the brand and 24 stores by 1967. In 1969 Sam Walton incorporated the stores as Wal-Mart Stores Inc., and in 1972 the company listed on the New York Stock Exchange and providing a cash injection allowing the company to expand to 125 stores by 1975, and 276 stores in 1980. Incorporation was also good for Wal-Mart employees, many of whom were given stock options in return for loyalty to the company. In 1970 Sam Walton started selling shares in his company over the counter to customers. By 1971 Wal-Mart stock was worth $47, not enough to make millionaires of Walton’s associates and customers but by 1982 increasing to a staggering $49,875 per share, enough to pay for a college education for the kids, an ambition that many of Wal-Mart’s employees were claimed to have held. Wal-Mart has been conservative with acquisitions, most company expansion coming from new growth, in fact Wal-Mart acquisitions have always been strategic in nature such as the first two takeovers, buying the Mohr Value Stores and Hutcheson Shoe Company in 1977, and then in 1981 buying Kuhn’s Big K Stores. It would be another 9 years until Wal-Mart would make another acquisition, this time purchasing The McLane Company. The internal growth of Wal-Mart has largely come from the group’s many Wal-Mart stores, but in 1983 the group opened the first Sam’s Club, a membership based discount retailer of bulk goods. Customer reaction to Sam’s Club was initially quite reserved despite lower prices, with accusations the cynical plan to build a database of small business owners who were the primary market for the new brand. Despite the criticism an aggressive expansion program has seen the brand grow to over 700 outlets although from 2006 Sam’s Club is no longer only targeting small business. Sam Walton remained with the company thru his life, continuing to visit stores and meet with employees even walking around the store with them as they completed their tasks. As a gesture of solidarity with employees Walton promised to do the hula wearing a hula skirt outside the NYSE on Wall Street if the company made a pre-tax profit of 8%, nobody is sure if the company was already projecting an 8% profit which would have made Walton’s gesture a simple publicity stunt, but in any event the employees got behind the goal and made it a reality. In 1992 Sam Walton was presented with the Medal of Freedom, the highest US civilian honor for services to American retail by President Bush Sr, and only a few weeks before he passed away at the age of 74. In 1998 Walton was listed in Time Magazine as one of the 100 most influential people of the 20th century. After his death Wal-Mart experienced several months of negative publicity as speculation mounted that Walton’s death and the appointment of his oldest son S. Robson Walton as chairman, and a lack of clear direction while the transition occurred would result in poor performance. Institutional shareholders played a wait and see game and Wal-Mart’s share price plunged but the uncertainty was short lived and by the end of 1992 had rebounded. 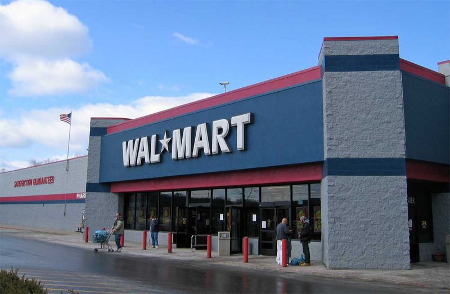 By the turn of the century Wal-Mart had become the first retail company in history pass the $100 billion mark and reports sales of $118 billion. Sales and profits continued to climb for Wal-Mart thru the early 21st century with no sign of any adverse affect from the weakening global economy but employee groups claim this is due to Wal-Mart’s policy of forcing off-the-clock work onto rostered employees who claim they are given too much work for their shift and told by management that overtime pay is out of the question. A number of class action suits have been brought against Wal-Mart which the company has vigorously defended and in many cases lost. Employee unions are severely restricted from operating within Wal-Mart so the full extent of the claims may never be known but by 2004 Wal-Mart had been ordered to pay fines and repay wages exceeding $300 million. At the end of 2006 Wal-Mart owned 6,775 stores worldwide, had over 2 million employees, and generated nearly $350 billion is annual sales. First I want to say WOW!!! Walmart has really grown ever since Sam Walton first opened this store in 1962. The annual sales of this retail company blew my mind out of the water as I read that at the end of 2006 they received $350 billion.